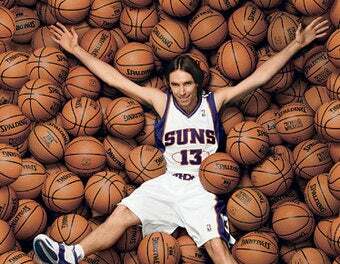 What Does It Mean When Steve Nash Says The Suns Will Stink? In an interview with SB Nation Arizona, Steve Nash looked at the Suns' roster and declared, "if I was outside this picture and a betting man, I would probably pick us to be outside of the playoffs." What does this mean? Putting aside the question of whether a franchise player should be saying these sorts of things—that's Bleacher Report's turf ("Slideshow: 15 Things Franchise Players Shouldn't Say")—let's look at why Nash is saying this. Simply: he's lowering expectations. The Suns lost Amar'e Stoudemire this off-season and replaced him with...Hedo Turkoglu and Hakim Warrick. They let Leandro Barbosa go, but have playoff hero Goran Dragic to take his place. Norse god Louis Amundson left as well, so it's easy to see that the team looks different going into this season. But has it changed enough to warrant this from Nash? "Maybe we need to take a step back, regroup, be a little bit more patient, build a really good team and see how good we can be later in the year instead of jumping out of the gate and be like, 'Oh, we've got to finish top two or three in the West and give ourselves a chance to win the West and go to the Finals.' That stuff can come if we really improve, but we can't put that type of pressure on ourselves right away because we are a new team." Turkoglu, Warrick, and Josh Childress should all play well in Alvin Gentry's system, and the team still has Grant Hill, Robin Lopez, Jason Richardson, and, you know, Steve Nash. The nerds are pessimistic — Basketball Prospectus's annual puts them at 37-45 — but I can see that team finishing in the conference's top eight. So what is Steve Nash doing? Here's a theory: He's engaging in another subtle, characteristically soft-spoken power play with Suns management. He signed an extension last summer—after sort of forcing the Shaq trade, mind you—and knows he's getting older. He sees this roster and doesn't think it's as good as the one that took the Lakers to six games in the Western Conference Finals. He's warning the fans that the Suns might be disappointing this year, and that they should aim their disappointment at the folks who put the roster together. Superstars pull this stuff all the time, and they usually catch hell for it. Part of Steve Nash's brilliance is that he does it so politely, it hardly even registers.